Upon opening our website and seeing the word Angkor Wat there, we assume that you might be checking in to see and to get some tourists information’s about the temples .We do not give all the information’s as the visitors guide book do, but we will try our best to provide you with some good information’s about some of the temples that we consider you should visit and a little bit about the Angkorian History. how long to stay, get your admission pass and arrange for transportations. The longer you stay the more chance you will have to see all of the temples. A good reason for getting a three days pass is that you can visit all of the major temples including some of the minor ones and still have time to spend at your favorite ones. While a one day pass you have to rush to see the main temples and like never really having time to enjoy very much of it. A one day pass might be cheaper than a three pass but you won’t enjoy the trip as much because of the rushing to see the temples. pass so that now you can take three days with a break – that’s right, they do not have to be used on consecutive days but within a week!! This means you can take a day at the temples, see a lot more than chill out the next day to regain some oomph for another walkabout – brilliant! Angkor Wat as you have heard is the most famous of them all, where ever you go talking about Cambodia people will ask “ you have you been to Angkor Wat?.” Because of its fame and being on of the world 7 wonders tourist tend to want to see it first. It was built by Suryavarman II and finished by Jayavarman VII On the other hand Ta Prom and Bayon are also magnificent. Ta Prom being famous for its giant silk and cotton trees growing out of the towers attracts many visitors. The atmosphere there is refreshing and you can take some of the best trees photos there. It was build by Jayavarman VII and dedicated to his mother and it was built in the style of Bayon. bas-reliefs; there are some real-life scenes from the historical seas battle between the Khmer and the Cham. Being surrounded by jungles Bayon is a bit dark for photograph taking near sunrise and sunset. But it is refreshing and a wonderful place to roam. Banteay Sri (citadel of woman) is called “the Jewel of Khmer art” because of its unique style among the great temples of Angkor. It was built in the late 10th century by a courtier named Yajnavaraha. In 967 A.D this Hindu temple was dedicated to the God Shiva. It was built largely of hard red sandstones that can be carved like wood. Brick and laterite were used only for the enclosure walls and some structural elements. The temple is known for the beauty of its sandstone lintels and pediments. Like most Khmer temples, Banteay Sri is oriented to ward the east. Many niches in the temples walls contain carvings of devatas or dvarapalas. The Angkorian Period lasted from the early ninth century to the early fifteenth and is considered the golden age of Khmer civilization. The temples ruins in the area of Siem Reap are the remnants of the Angkorian capital and represent the pinnacle of the ancient Khmer architecture art and civilization. The Khmer people were among the first in Southeast Asia to adopt religious ideas and political institution from India and to establish centralized kingdoms encompassing large territories the Khmer region was a highly developed and thriving state. They lived along the coast and in the lower Mekong River, valley and delta regions. The kingdom of Funan was rule by the Liang-shu according to the Chinese dynastic history. It was one of the first known in Southeast Asia. The kingdom’s economy depended on rice surpluses produced by an extensive inland irrigation system. Funan had once been a strong maritime state, actively involving in sea trades, but it was soon concord by another kingdom called Chenla. Chenla a brake-away kingdom around the middle Mekong lasted only for a short period. It was rule by king Isanavarman I who made Chenla disintegrated into smaller warring states. Later after his death King Jayavarman I brought it back together in the mid 7th century only to fall apart again after his death. On traditional accounts, Chenla finally broke into two rival states, ‘Land Chenla’ in northern Cambodia/southern Laos, and ‘Water Chenla in centered further south in kampong Tham. But in 715 these two Chenlas were further broken up into smaller states. And the first king of the Angkorian era was Jayavarman II. He was a great warrior and kept on enlarging his kingdom till the time of his death in 850CE. The kings that reigned after him started to build great temples dedicating it to their gods. Suryavarman II was one of the greatest Angkorian kings; he like Jayavarman II expanded his kingdom in a series of successful war against the kingdom of Champa. His greatest achievement was the construction of the temples Angkor Wat. But it was soon destroyed in 1177 by Cham. But another great king Jayavarman VII came to the throne and drove the Cham away. He soon restored Angkor Watt back to what it was and he was the first king who changed the Khmer religion from Hindu to Buddhism. 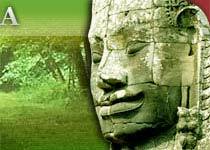 During the Reined of Jayavarman VII the Khmer people were prosperous but after his death everything started to go down hill little by little. The four temples that people usually miss are Bat Chum, Chau Say Tevoda, Preah Palilay and Banteay Samre. These marvelous temples are miss ether because of too little time or they are too small and far to be worth going to. Bat Chum was constructed in the mid 10th century, it was dedicated to Buddha. King Rajendravarman was the ruler of Bat Chum. Chau Say Tevoda was built in the early 12th century in the style of Angkor Wat. And it was built during the rule of king Suryavarman II. Preah Palilay was built in the 13th century. The tower was rebuilt again in the post-Bayon period. It is located in the forest area behind the Terrace of the Leper King. There are many carving of Hindu and Buddhist themes. Banteay Samre was also built in the style of Angkor Wat by king Suryavarman II in the mid 12th century. It also resembles the Khmer temple of Phimai in Thailand.